The clinically-published ASV algorithm constantly learns, responds, predicts and synchronizes with the patient’s respiratory pattern to help rapidly stabilize respiration. The pressure support varies to respond to the patient's need. Mandatory breaths are delivered at the patient’s recent spontaneous breath rate. 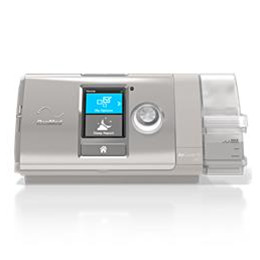 Climate Control comprises the HumidAir™ humidifier and the ClimateLineAir™ heated air tube and is designed to deliver constant, comfortable temperature and humidity levels during therapy and aims to minimize the common side effects of therapy to increase compliance.